It was early January. Christmas was over with and the 2 youngest girls were back at school. Dot was just the same. Her and I were both at a really low point. I’d always kept positive with her in the past. If a treatment failed I was ready to get on with plan B or C or whatever plan I had lined up next. Only this time I had no plan B. We were still convinced all the medical professionals were missing something. There was something seriously wrong with her and they’d find it when it was too late. One night I decided to ask a Facebook friend to post anonymously for me on one of the eczema support groups. She put a plea out for me asking if anyone else had a child with severe eczema that was having the health issues and symptoms that our Dot was having. I wasn’t really expecting to hear anything back but the post got two replies back quite quickly. One was from a lady in London who said her daughter had been exactly the same as Dot. She had been in and out of hospital with infections and nothing had worked for her until she heard about, and contacted a Private Doctor who had turned her daughters life around. The other was from a lady who’s son had been treated by the same Dr 7 yrs before. She had contacted him after seeing him on a morning TV show. She lived about an hour from where we live, which somehow made her seem more ‘real’. That sounds awful, but going having gone through all that we had, I was really untrusting of everything and everyone. I was particularly interested in what the London lady had to say, as her daughter seemed to have had it as bad as our Dot. So I searched the support group for her story. It all sounded so positive. The lady’s daughter had been turned around in a matter of days. Then another reply came from a mother of a baby who’d had a horrendous time with infections, etc. I was starting to get excited about this. I spent the next week googling and searching for more info on this Doctor. I discovered he lived in South Africa but also worked in London for part of the year, and his consultation was via E mail. He specialised in childhood eczema and had treated over 8,000 patients. I read the testimonials on his website and saw nothing but positives. I was a bit nervous at the thought of putting our daughter’s health in the hands of a doctor we were unlikely to ever meet, but somehow it seemed the right thing to do. So after talking it through with our family and friends, we decided to contact him – Dr Richard Aron. On the 11th of January, we emailed Dr Aron with details of the last few years. He replied almost immediately and we sent him photos of Dot, along with the £80 consultation fee. He emailed a prescription to a chemist in London, gave us directions for use, and assured us he would soon have her back on track. Despite the years of failed treatments, I had a good feeling about Dr Aron. I’ve no idea why, but I just knew that this was going to work. And work it did. On Wednesday the 15th of January, we started the treatment. The prescription was a mixture of moisturizer, steroid and antibiotic – the bulk of it being the moisturizer. We were instructed to apply the mix 6 times a day for for a week then e-mail Dr Aron with photos and a progress report. The first time we applied the cream, Dot said it felt a bit stingy but soothing (I remember this thanks to my diary). By the end of day one, I could see a difference in her face. It was only slight but it didn’t seem as inflamed. Day 2, she was still sore and dry but full of beans. When she got up on Day 3 her face was pale and peeling like sunburn. She was still awake at midnight but then had the best sleep she’d had in ages. Day 4 was Saturday and she was bouncing. It was as though her life had been switched back on. She and our other 2 girls were on a high. They had their sister back and they were delighted. We were delighted! It was like a party in our house that night. The girls got an armful of snacks and all slept in the same room. We were completely overwhelmed by the change in her. By the end of the first week, her skin had calmed down enormously, her energy levels were up and she was laughing and playing with her sisters again. She was still a little tired and had a few small sweating episodes but apart from that we were amazed by the change in her in just a week. After the first 7 days,the applications were reduced to 4 to 5 times a day. We mostly did 4 in a day. A few weeks into treatment, we went back to the GP to show him the amazing results and to ask for the creams to be prescribed on the NHS. We expected that, after seeing her suffer so long, he would be delighted for her. We didn’t expect the response he gave. No way was he going to prescribe something a private doctor had suggested. He said it would be seen as the NHS funding private treatment and that would be illegal – despite the fact that we must had had tens of thousands of pounds worth of products out of the NHS over the past 5 years, not to mention the cost of hospital admissions, and none of them had worked! And yet here was our Dot, sitting in front of him, looking better than she had in years and he wasn’t interested in the slightest. I left feeling very emotional. To get the creams prescribed would have been a big help financially, but aside from that I couldn’t get my head round the fact that he had no interest in how good her skin was looking and how quickly her health was improving. Dot’s grandparents were paying for the creams for her but that was beside the point. They shouldn’t have to. For one thing, she was a child who was entitled to free prescriptions and all the elements of Dr Aron’s mix were available on NHS prescription. By chance the following week my sister sent me a cutting from the telegraph newspaper. It stated that if something was working for you and it was approved by NICE,then you were entitled to ask for it on the NHS. Click here to read the telegraph article. She still wasn’t having any of it. I then pulled out and cited the Telegraph article and asked who I could complain to. The nurse in the room actually told me to write to our local MP. The Dr eventually agreed to recommend our GP prescribe the creams which we could then mix at home. I came out of that appointment furious, that yet again I’d had to fight to get something to help my daughter. During the following months, we continued with the treatment, e-mailing Dr Aron regularly with progress reports and photographs. Our Dot continued to improve and started going more regularly to HTTS – the out of school tuition service that she had started when she had been off school several months. They were amazed and delighted at the change in her. I was also spending more time on the Facebook eczema support groups. I wanted to share our Dot’s success with other families that were suffering. A few of the mums took our reccomendations on board and also went on to have fantastic results with Dr Aron, so therefore passed on their experience. One of the mums set up a group for people who were using, or thinking of using, Dr Aron’s treatment regime. Its called ‘Dr Aron eczema treatment discussion group‘. The group started with about 8 members and now has over a thousand members! Dot went back to school in September into year 9. She had been off for 18 months. She struggled in the early weeks. After so long away, she was finding it a bit overwhelming, but with the support of the school and with her friends by her side, she’s now doing fantastically well. After going to hell and back,and living a half life for many years, Dot is now living life to the full. Dot asked me to share her story so other families may be helped from her journey. We will keep on spreading the word about Dr Aron and hope that one day, the way that eczema is treated will be changed. If you or your child is struggling with eczema that you can’t control, please take comfort from our story and don’t ever give up. There is light at the end of the tunnel,our Dot is living proof. Ok,so before I go any further I would like to clarify something..This isn’t an ITSAN bashing blog as I’ve already been accused of. It’s my story about our family’s journey through out of control eczema..I’m not going to let it become a platform for the steroid/anti steroid debate that’s seen daily on the Facebook support groups…I’ve already received comments which I find quite intimidating and which to be honest I’ve only skimmed through. I won’t be bullied into not sharing Our experience. ITSAN members are very passionate about their cause and following what they believe to be the only way.We all make our own choices from what we read and hear about and can be influenced by other peoples experiences and beliefs,that’s why I’m choosing to share our story in the hope that it may help individuals decide which path they choose to take.. I can clearly remember the train journey home from Salford. We’d been to an appointment in the dermatology clinic and came home with the usual feelings of disappointment that seemed to follow us around. At the clinic, the Dr was shocked at the state that she was in. She was shivering, listless, itchy and red from head to toe. She asked how long she had been like this and when was the last time she had been seen by a doctor? I’m certain she thought she was a case of neglect. We were relieved when she listened to everything we told her and called in the consultant. We thought at last they were going to get to the bottom of it all.We thought he would admit her there and then and they would get her sorted out.We were wrong of course. Although he agreed she was unwell, he decided that it would be of no benefit to her to be admitted to hospital as the hospital was busy and we would be left for hours on end. Instead, he loaded us up with antibiotics,oral steroids and more potent topical steroids. Sitting on that train on the way home I felt numb and defeated. For a long time now I’ve been a member on quite a few Facebook eczema support groups and flicking through on my phone that day a post caught my eye. It was from a mum of a young girl who had through a terrible stage where her eczema was worsening despite being prescribed stronger and more potent steroids, there were a couple of comments on her post from other mums who had been through the same with their children. They talked about their children’s worsening eczema and despite being on potent steroids, not being able to get on top of their child’s skin. They had stopped the steroid creams and after a few awful months had seen huge improvements and hadn’t looked back. It was a light-bulb moment for me. The steroids I was putting on her skin were actually making her eczema worse. It all made sense. Two of the mums sent me lovely e mails after I asked for more info and I began trawling through the internet to find out more. There were scores of kids out there with skin as bad as our Dot and who weren’t getting any better. I sat up till the early hours reading everything I could find and I joined the support group ITSAN,which stands for International Topical Steroid Awareness Network. There weren’t many members at the time I joined,but the ones there were had been in the same boat as us – steroids were no longer working for them and were actually making their condition worse, a vicious cycle of uncontrollable flares and more potent steroids that weren’t helping. It was comforting to know we weren’t alone and there was a way out of it all. The way out was stopping all topical steroids cold turkey and basically riding the storm of the rebound flares that would follow. It wasn’t going to be easy but it couldn’t be much worse than how things were..or so we thought. I’m not going to get into ITSAN too much. I met some lovely people through the group and the support was brilliant. As I said at the start,everyone has a right to choose which path they take but at this point we felt we had little very few choices left so we chose to go down the TSW route. 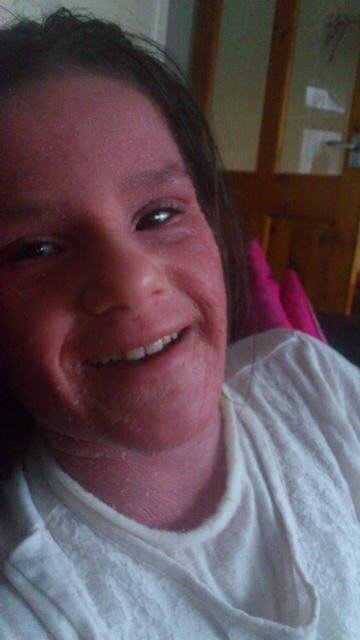 TSW stands for Topical Steroid Withdrawal and that was what we were about to put our Dot through..
Little Dot was still on a course of oral steroids that she had been on for a week or so and, as I knew it was dangerous to stop them suddenly. We gave them them to her till the end of the course, tapering them off as we’d been told. Despite being on the orals, her skin was still not great. Wed the 18th of Jan 2011 was the day we stopped all topical steroids. By the following Thursday, her body was covered in pus filled spots. The next day the spots all burst and left her covered in open sores. Monday the 30th, she was down to 3 steroid pills a day and was red all over and very itchy. As the week went on, her upper body became redder and her eyes and neck were splitting open. We went to her GP, the skin specialist armed with the info that we’d printed off,he looked at us as though we were insane. I remember him typing away furiously on the computer but saying nothing. We left him with all the info but doubt he even looked at it. We were treating her open sores with an antiseptic cream and moisturizing with Vaseline. 10 days into the treatment Dot developed what she now refers to as “The Beard”. Her chin broke out in an oozing yellow crust that really did resemble a beard. It was horrific. By the next day it had scabbed over so she couldn’t eat without it splitting open. I remember bathing it in the bath and it came off to leave her face completely raw underneath only to scab over again later. 2 weeks in and her eyes were stuck together and had pus running from them. Her neck raw and wet – upper body and arms red raw. 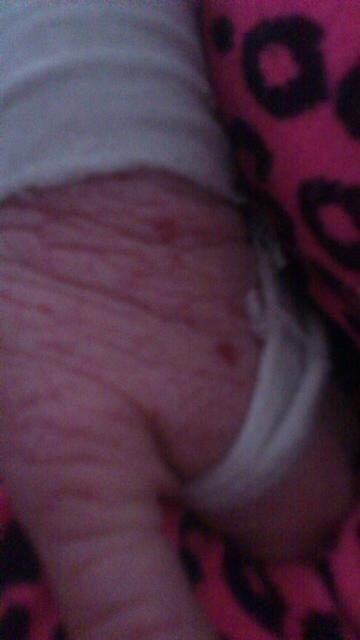 Feb 14th, 3 weeks off topical steroids, her body was like sandpaper. Her feet,ankles and wrists were red and splitting. 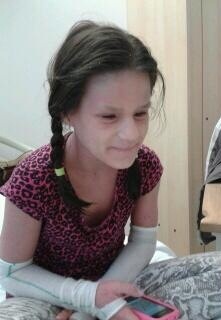 We were wrapping her arms in bandages as they were so sore. Then her feet and ankles broke out in pustules which burst to leave open, oozing sores. Goodness knows how but on the 20th of February she went back to school. The amazing lady that was her teacher looked after her when she was there. She was like a second mother to our Dot through all of this. There’s not many teachers that would have done for a child what she did for our girl and we will all be eternally grateful to her. I knew she was safe with her. That meant so much. Fortunately I still have the diary from 2012,which is a big help writing this part as there’s no way I would remember half of it. Reading back over it is really upsetting and brings the horror of it back to me. At the end of February, we made the decision to take Dot out of school till after Easter. This would give her a few weeks to rest with no pressure to be up and out every day. Her skin stayed pretty much on a level for a while. It was an awful level but a level. By now she was so sore behind her knees that she walked bent over with her bent legs and on her toes,a pitiful sight really. The itch was constant and so intense and the sweats were increasing in number and severity. The routine most days was getting her up and bathed, grease her up and try and keep her as comfortable as possible. She had no interest in doing anything and was struggling to cope. The sweats and the oozing caused her the most distress. I felt completely useless. According to Dr Rappaport, who’s ideas and beliefs ITSAN followed, the only treatment for the withdrawal was cold compresses, ice packs, pain relief and time.How long it would take could vary from months to yrs. What a daunting and depressing thought that all we could do was ride the storm and watch our precious girl suffer. April the 19th Dot woke with pains in her back. By that night she had 2 large patches of blisters, we took her to the out of hours doctor and they said she had Shingles. 2 days later she spent her 11th birthday miserable and in pain and didn’t move from the sofa all day. She used to just sit there in silence staring at her hands. The next few months passed in a blur of blood sweat and tears,literally. The sweats were lasting up to 3 hrs at a time and were distressing and exhausting for her. 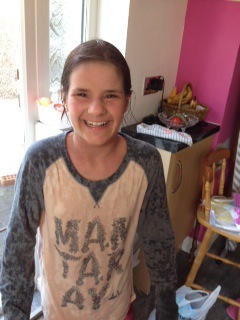 In June, when her friends were going to transition days at the senior school, our Dot only managed one half day. As life was going on, her life was passing her by. Her best friends would call after school but she was too unwell to be bothered so they would play with Dots younger sisters. She was so worried about them seeing her unwell and upsetting them that she often put off their visits. They weren’t easily put off though and I’m so grateful to them for keeping coming and sticking by her. The 4th of July was the day her class were going for their last school trip together. They were going to London and had a fantastic itinerary planned. Little Dot was too unwell to go. That was a bad week. Wednesday 11th July, Dot had an appointment back at Salford. This was the same dermatologist we had seen 24 weeks before. My sister came to the appointment with us as I was too scared to go on my own. Fancy a grown woman being frightened of a doctor, but I was terrified that he was going to try and bully us into using steroids again, which he did. He wasn’t having any of the ITSAN propaganda as he called it. She needed steroids and if I didn’t comply then I was letting her down. He didn’t use these exact words but that’s what he implied. We had a huge row, all in front of our Dot and I ended up leaving in tears with a prescription for antibiotics and potent topical steroids. The antibiotics, we gave her and the steroids went in the bin. Why on earth would I use them on her when it was the steroids that had got her into this state? When we got home there was an appointment waiting for us for Manchester Children’s Hospital. The GP that we really like at our surgery had referred her several weeks earlier as he was also concerned about the symptoms she was having. We went along for the appointment the following week with a bag packed and as we expected, she was admitted onto the ward. They gave her a really thorough examination and arranged blood tests. Thankfully, they respected our wishes for no steroids. She was put on 2 types of antibiotic and started on the immune suppressant cyclosporin. She was also given Protopic ointment to use on all over as a replacement for topical steroids. They assured me that this was a much safer option. She stayed at Manchester for 10 days and came home looking and feeling much better. We felt we had finally cracked it. She was still having occasional sweats but not as often and she wasn’t so exhausted. We were over the moon. We finally thought we could put it all behind us and she could get on with her life. We went on holiday to Spain the following month and although she wasn’t 100%, we had a really good week. She was still having some intense itchy spells and sweats now and then but we expected them to eventually fizzle out.When she started senior school in September she took it in her stride. We couldn’t have been happier. Unfortunately, this good spell was short lived. The cyclosporin was only to be used short term so they started tapering off the tablets over the next few months. By the 21st of December, she was off them completely and her skin was raging again. The infection was back and the Protopic was making it worse. The sweats and shivers were back big time so it was back to the doctors and back on antibiotics. By now we were running out of options for her. We took her to the GP and she was given antibiotics. She was due back to Manchester for a review in January so we just had to get through till then and see what else they could do for her. Christmas came and went and we did what we could to enjoy it for all the girls. The few photos we have of her on Christmas Day are awful. She was so red and so itchy. Things came to a head on Monday the 14 th of January. Dot had had a terrible weekend. She was off the antibiotics that she’d started before Christmas. Her skin was unbelievably itchy and the sweats were coming thick and fast. On the Monday morning, I rang the GP and waited all day for a call back. She started sweating that morning and it lasted the entire day. We were all beside ourselves when they finally rang back and told us to take her to hospital and expect to be admitted. We did and she was – back on IV antibiotics. This time, they brought out the big guns,Tiacoplainin. I think that’s how it’s spelled. It’s what they use for MRSA. They were thinking she had become resistant to the others she’d been having. We were told that a side effect could be red man syndrome, where the body turns red. How the hell would we know? She was like a beet root as it was. She was put in a room on her own and we were left to get on with it. I stayed with her the first night – and the second night she said she was ok if I left her and went home to be with her sisters, so that’s what I did. When I went back in the next morning, I was horrified at the state of her. She had been sweating and itchy through the night and had torn her skin to ribbons. What a mess she was in. I was livid that they’d left her to it. They said they’d checked on her and she was fine but clearly they hadn’t. 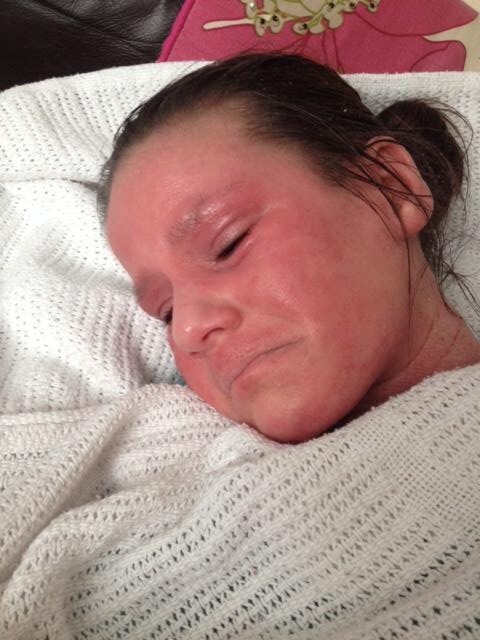 The following Sunday when the IV antis where finished she was sent home. The infection seemed to have cleared but other than that nothing had changed. On Friday the 25th of January, I spoke to the consultant she was under at Manchester and was told to bring her in on the Sunday when they would have a cubicle ready for her. On my request, they did Rast testing, as we were thinking maybe something she was eating was responsible for her constant flares. The results came back with high readings for milk and wheat. We thought great – this is what’s causing all this. Get her off the offending foods and she’ll be sorted. We spoke to a dietitian and got started. She was also seen by a psychologist who seemed to think the sweats were panic attacks. She gave her a questionnaire to answer which she just stared at. By now she seemed to have lost the ability to think for herself. Even answering simple questions was beyond her. It was as if she was trapped in her own little world – just trying to get through each day. 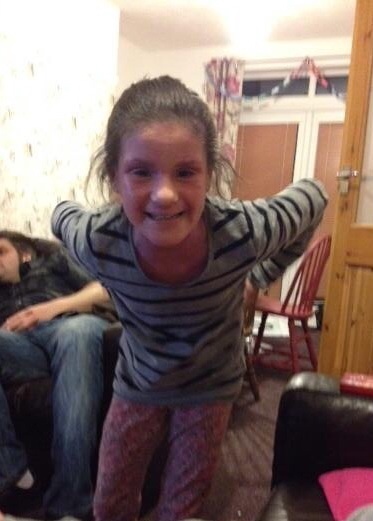 Terrible to see our vibrant, happy girl turning into a shadow of her former self – totally heartbreaking. So with the diet started and psychology appointments in place, a week later we were on our way home once more. Dot went back to school after the February break but it wasn’t good. Her skin was on fire and cracked open in places. She would come home at lunch time and collapse in tears. She was struggling to get through the days. She was having to put cream on her hands which made her books greasy which meant her pen wouldn’t work. She was mortified when a boy passed comment about the skin all over her chair and she was having the dreaded sweats. The final straw came when she came home and said she had been stood in the corridor for most of the day. She had had a sweat and the teacher said she could cool off outside the class. This happened in a few lessons in the same day. She said a couple of people passed and asked if she was ok, but that was it. The thought of her stood outside like some sort of class dunce did it for me. I took her out of school that day and assured her that she wouldn’t be going back until she was well. That was mid June 2013. She didn’t return to school properly till September the following year, 18 months later. 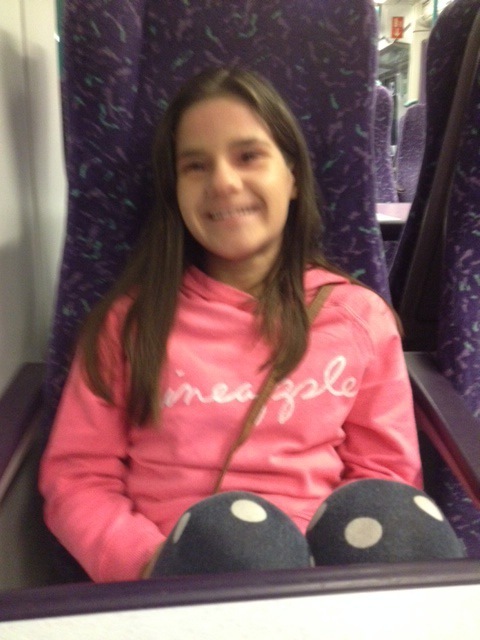 Throughout the next few weeks she had appointments with the dietitian and the psychologist at Manchester. It was a 2 hour journey each time and really took it out of our Dot. By the time we arrived, she was always in a state. She would sweat and itch the whole time and wouldn’t/couldn’t speak to them. I hate to say it but I would sometimes end up cross with her for not cooperating. To go all that way, to have the stress of her sweating and itching the whole journey and to then have the appointment abandoned after 10 minutes was frustrating to say the least. After all that had gone on I was at the end of my tether. I had given up work in the January to look after her so it was full on 24 hrs a day. Our lives revolved around her skin and her health and it was taking its toll on us all. On the 16th of April, we were on our way back to Manchester – yet another admission. I don’t remember a lot about that one to be honest. I remember seeing a different consultant this time who was very patronizing and who was desperate to get Dot back on either steroids or Protopic. I remember her making me cry and I clearly remember saying that I wish I could be locked up in a box and let out when it was all over. I also remember the consultant witness Dot having a 40 minute long sweat and ignoring it. They did several tests including scans on her lymph nodes and her chest – again,all normal. We left there 2 weeks later no different to when we’d gone in. 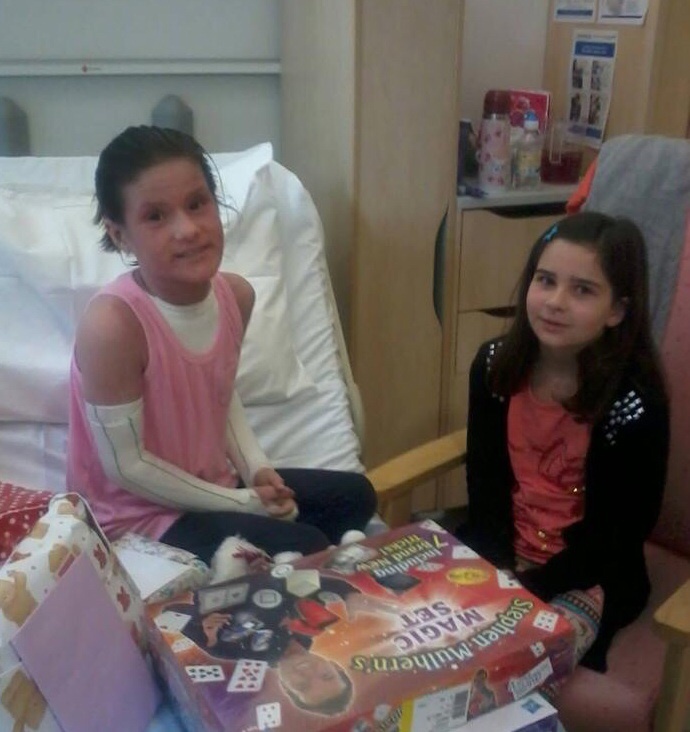 Oh I forgot to mention – she had her 12th birthday while in hospital that time. Did I mention earlier that Dot had been referred to St Thomas Hospital in London? Well that appointment came through for sometime in June or July. I really can’t remember which. We traveled down by train and were seen by a lovely dermatologist. Yet again, Dot was admitted under the care of the lovely doctors and nurses of the Evelina hospital. 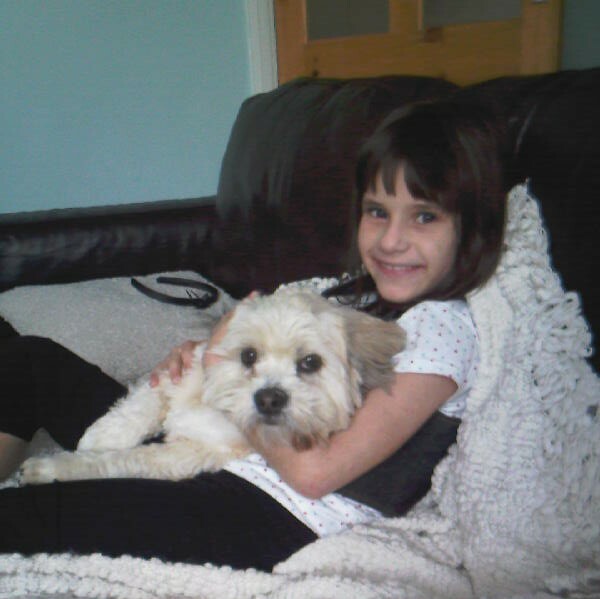 After going through everything, we were told that the only way she was going to get better was with topical steroids and as the other immune suppressants hadn’t worked she was to be put on methotrexate, a drug that’s used in chemotherapy. They explained that the steroids would be short term until the metho started to work. By now I felt completely defeated. What choice did we have? None. The treatment was started immediately – oral antibiotics, oral steroids and intense topical steroid and moisturizing therapy. The greasy moisturizer was to be applied every 2 hours and the steroid ointment every 4 hrs. When the nurse came with that tube of steroid ointment, I thought Dot was going to have a heart attack. She was so stressed over it. We’d been convinced for the last year and a half that steroids were the enemy and were to blame for the state she was in and here we were about to slather her in them! I think the poor nurse thought we were insane. I think by then we almost were. 2 weeks later we left. Dot was still on the oral steroids and using the topicals 4 times a day now. The methotrexate hadn’t been started yet. They needed to be able to do regular blood tests and her needle phobia made it impossible without pinning her down and they weren’t prepared to do that. They sent her home with a plan in place to start needle phobia therapy then get her onto the methotrexate. In the meantime, keep her skin controlled with the topical steroids. Sounded great,in theory. What we didn’t bank on was the eczema raging out of control again once the oral steroids were stopped. It was another month on the orals and keeping on with the topicals – only this time it wasn’t working. Despite all our efforts, it was all spiraling out of control again. How i remained sane at that point, I’ll never know. Christmas was upon us again and a year later, nothing had changed and now what options did we have left? Absolutely none. We’d tried everything there was and this was it. I’d never felt so low in my life. If this was to be it for the rest of her life what was the point anymore? Every door had shut on us and we had nowhere to turn. I hate to admit it but I was ready to throw the towel in. 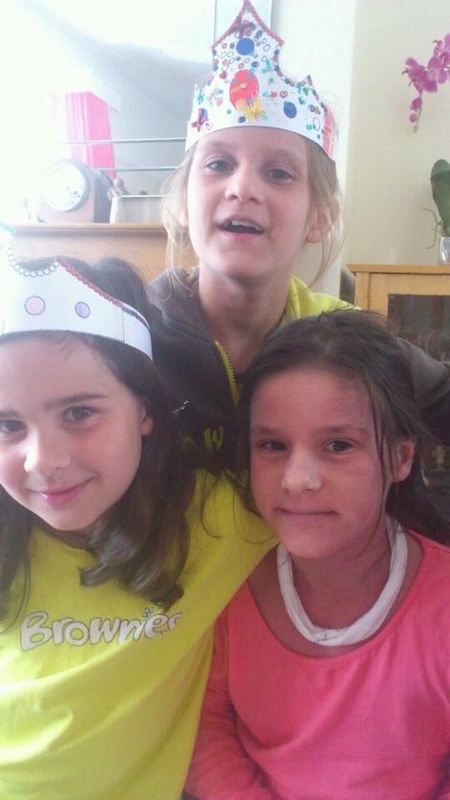 And then – our miracle happened..
Part 2 – The Worst Year..
From 2009 Little Dot was having a lot of infected flares. She would be given antibiotics and often oral steroids and things would settle down again but as she was having them so frequently our GP, who was also a skin specialist (we moved to this practice so she could be under him) decided to put Dot on long term antibiotics to see if it would ward off infections. She was on Clarithromycin for about 6 months. 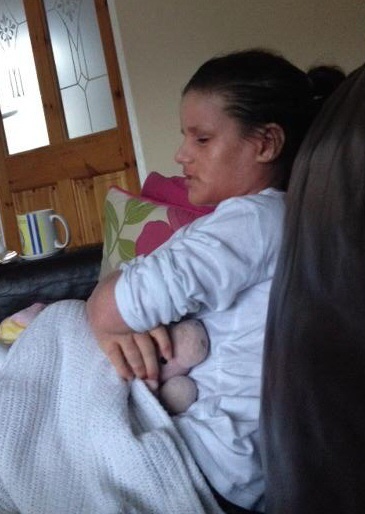 It made no difference, she was still getting infections, she would be given different antibiotics and often more oral steroids, but as soon as the course finished the infection would return… on and on it went. 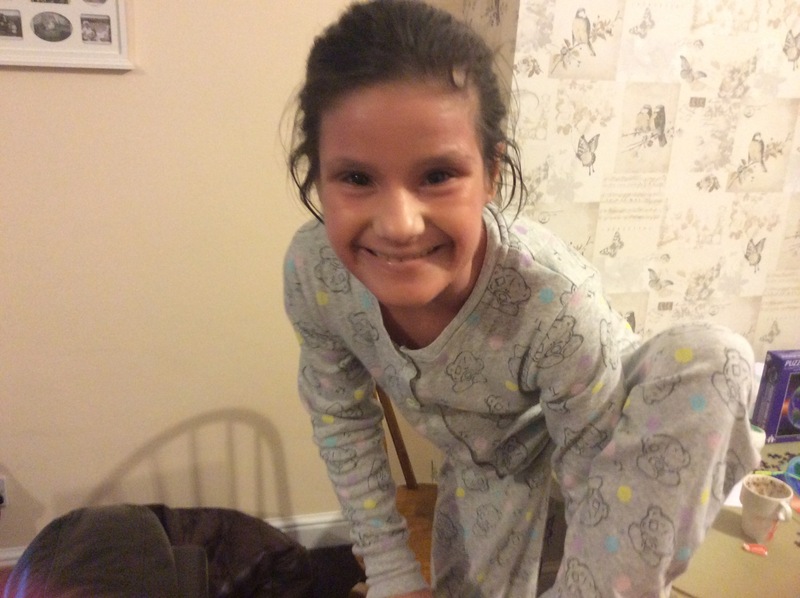 We went back and forth to our GP all summer, we were worried sick that there was something wrong with her, only to be told that we should expect her to be unwell due to the severity of her eczema. But she has had eczema all her life and had always been a healthy girl, it just didn’t add up. I remember speaking to our GP on the phone in tears one day and asked him what he would do if it was one of his children, he just said “I’d go to the chemist and get her a multi vitamin”! I hung the phone up in despair that no-one was taking us seriously. Eventually, I’m sure to humour us, they agreed to do some blood tests, an ordeal in itself as our Dot has a massive fear of needles and has to be restrained to get blood from her, totally wrong but it was the only way to get the tests done. Basic blood tests were carried out which all came back within the normal range. A few weeks into the summer holidays her lymph nodes all over her body became enlarged, one in her groin was the size of an egg, back to the GP who said it was due to her eczema, however when she was seen at the dermatology clinic a few weeks later they were alarmed at the size and number of the nodes and had her admitted to the children’s ward for further tests. By now she was having sudden heavy sweats as well as shivering and cold. They were concerned enough to do a lymph node biopsy as her symptoms were similar to what a person with lymphoma would have… After an agonising 4 week wait for the results we were told all was normal. 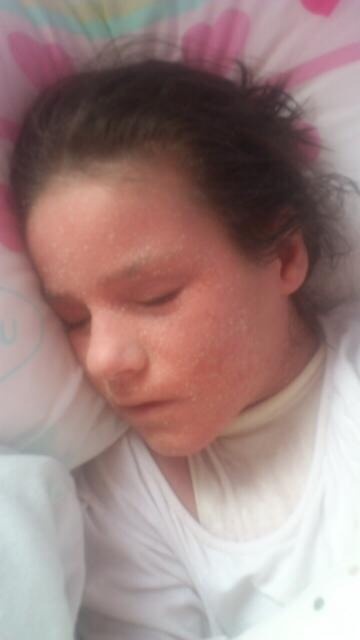 By the end of the summer break she was worse than ever, she had so little energy she could hardly stand, she’d lost weight and the sweats were coming more often, her skin was still a huge problem despite still using potent topical steroids daily. She went back to school in September in a sorry state. 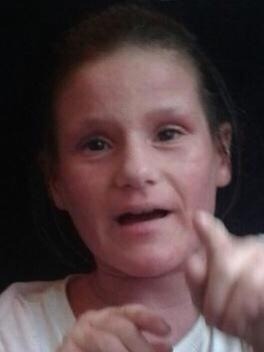 By this time she had been referred to the dermatology clinic at Salford Royal Hospital in Manchester. The Consultant there seemed really nice, we saw him quite a few times and tried a handful of different steroid creams, but as her eczema wasn’t responding or ‘switching off’ he decided to put her on the immune suppressant Azathioprine, he explained about the possible side effects but said it would give her a better quality of life, improve her skin and eventually enable her to get off the topical steroids that she had now been on for several years on and off. We were all excited, and when we picked up the prescription from the chemist we were singing on the way back to the car. At last she was going to be free of this horrible disease that was robbing her of her childhood. How disappointed we all were when weeks later there was no improvement, if anything she was worse, I was gutted for her. So continued the infections, the antibiotics, the steroids, and still she was just about managing to get through her days at school. I spent my days and nights searching the internet for answers. We spent hundreds of pounds travelling miles to see a homeopath that came highly recommended, again Dot and we thought this was to be ‘it’. It was a complete waste of time and money and yet another disappointment for our girl. We did the York Test, where they test a drop of blood for food sensitivities and paid a clinical nutritionalist who gave us a food plan and told her she would get better if we stuck to it, all it did was make her miserable and trippled our food bill and needless to say it made no difference. We paid £350 to see a private paediatrician who specialised in the adrenals as another GP thought her symptoms suggested adrenal suppression which could have been caused by the years of steroid use, again all came back normal. By now Our Dot was having more and more days off school, she was in year 6 and they were working towards their SATS so she was anxious about having time off, so most days she would try to get her there despite the state she was in. Her teacher was wonderful with her, she would cream her when needed and settle her down when she was itchy or sweaty, she would try to get her through the days the best she could, and when Dot couldn’t manage any more, her lovely teacher would ring me to collect her. Sometimes she would last all morning and some days only an hour or so but every day she tried. The worst days were when she had the sweats, they would come from nowhere and last for anything from a few minutes to several hours… so distressing for her, but she tried really hard every day to keep going.